Scarsdale NY – The 11th Anniversary of the Scarsdale Concours d’Elegance is coming up this October. 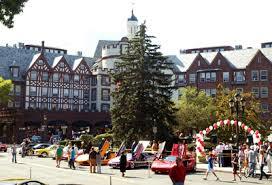 The event is the second longest running Concours in the Eastern United States. The show will be held in the heart of beautiful Scarsdale Village, 29 Chase Road, Scarsdale, New York. Scarsdale is easily accessible from anywhere in the tri-state area and there is ample free parking. This year’s show follows the success of last year’s 10th Anniversary event with 132 cars participating (plus approx. 25 new vehicles from a variety of sponsors, including BMW, Miller Motorcars, McLaren Greenwich, Pepe Porsche, Mercedes-Benz, Cadillac and Infiniti. Over $32,000 was raised for charity benefitting the White Plains Hospital, Scarsdale and Edgemont Family Counseling Service, The Wounded Warriors Family Assistance Fund and the Scarsdale Foundation. This was an increase of approx. 30% over the 2012 Event. The 2014 edition of the Concours is scheduled for Sunday, October 5, 2014, slightly earlier than usual, and the organizers are hoping to enjoy some beautiful early fall weather. Beneficiaries of the event once again will include several very worthy local charities including The Scarsdale and Edgemont Family Counseling Service and The Wounded Warriors Family Assistance Fund. This year’s panel of judges will be comprised of distinguished members of the automotive press from various media outlets, including Top Gear, Consumer Reports and Car & Driver. Public viewing will begin at 10:30 a.m. and will feature over 130 American & European automobiles as well as some displays of new vehicles from various manufacturers and dealerships. Viewing ends at 4:00 p.m. with Final Judging and an Awards Ceremony, followed by a champagne toast to the winners.